The Council undertakes Residents and Community Surveys in consecutive years to seek feedback on what residents think of Council services such as water supply, roads, and rubbish and recycling collection. Both surveys seek about 1,000 responses from randomly chosen residents. The Residents Surveys are longer surveys which also seek information on topical issues. The last Community Survey was run in 2012. In 2013 the Council undertook the Residents Survey and hired the research company Research First to conduct the survey. A summary of the results of the 2013 Survey is provided here and you can also read the 2013 full report [PDF 1.9mb]. Research First conducted telephone interviews with 1,005 Selwyn residents across the district between 26 May and 10 June 2013. A quota system was used to ensure the people participating were representative of the age, gender and population of the Ellesmere, Malvern, Springs and Selwyn Central wards. The survey asked a range of questions about what people think of Council services (e.g. 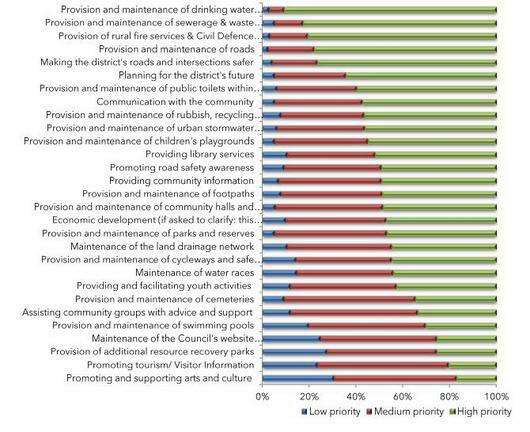 water supply, swimming pools, parks and reserves, footpaths and roads), how often people used the services, and what priority they placed on these services. Respondents were asked if they had used the service or facility and then given a choice to rate the service or facility as “very good”, “good”, “neutral”, “poor” or “very poor”. Questions were also asked on what people thought of the Council planning for the district’s future. To help Council’s future planning, residents surveys also seek information on topical issues. For example, in this year’s survey, residents were asked how long they had lived in Selwyn, why they chose to move to the district and what they thought of their neighbourhoods. The Council also asked people what they thought of the Council’s role and performance during civil defence events. Overall, 58% of residents surveyed rated the Council’s overall performance as “good” or ‘very good” while 11% rated the performance as “poor” or “very poor”. Most respondents rated the performance of Council facilities as “good” or “very good”. The most commonly visited facilities were the public parks and libraries which respondents rated as being “good” or “very good”. The least highly rated facilities were public swimming pools and public toilets with less than half of those surveyed saying they had used these services. Most respondents also considered the waste management services (rubbish, recycling and the resource recovery park) provided by the Council to be “good” or “very good”. Of the almost 40% of respondents who had used the recovery park, most thought it was a good service with only 5% saying they thought the facility was not good. With regards to the water services, respondents were most satisfied with sewerage and waste water and drinking water. 77% of respondents rated sewerage and waste water services as “very good” or “good” and 66% rated drinking water as “very good” or “good”. Most residents were highly satisfied with licensing services provided, the road safety promotions (both rated at “good” by 65%), town streets and footpaths (61% considered both these “good”), while only 36% considered the Council was providing a good service in the provision of cycleways and safe cycling routes. Just under half of respondents (approximately 40%) were satisfied with the Council’s performance on responding to requests for land and property information and carrying out building inspections and fewer (approximately 22%) were satisfied with the Council’s performance on processing and issuing building and resource consents. However about 50% of respondents considered that the Council was doing a good job in its strategic planning for the district. Although many residents have lived in the district for over 10 years, there are large proportions of residents in Rolleston, Lincoln and Leeston who moved to the district less than 5 years ago. Many people moved for family reasons or because they found employment here. When asked about what people thought of their community and neighbourhood, most respondents felt that they felt a sense of community with their neighbours and many felt that it was easy to get to know people. Main concerns identified by respondents included road safety and theft or burglary. When asked about the Council’s civil defence services, most respondents rated Council’s performances highly on rural fire control and civil defence but less highly on helping to prepare for, or recover from, disasters. Residents were also asked to rate a broad range of services on a priority scale. Services most highly rated included drinking water, rural fire services and sewerage/wastewater. Services rated least high were promoting arts and culture, promoting tourism and visitor information and the provision of additional resource recovery parks. What does the Council do with the results of the survey? Survey results provide the Council with a general understanding of what residents may think of the services it provides as well as the priority residents place on these services. The Council uses the results in a number of different ways. Survey results can be used to provide Council with initial understanding on a topic the Council plans to conduct further work on. Results can also be used to provide support or not, on work the Council is doing or plans to do as well as provide Council with an indication of what improvements may be needed for the delivery of key services. Residents survey results are also used in the preparation of Council’s strategic documents such as the Long Term and Annual Plans and its policies. The Council will be running a shorter survey next year which will ask similar questions of a similar number of residents.